Packers K Mason Crosby has been named the NFC Special Teams Player of the Week following his 5-for-5 day on field goals last Sunday vs. Detroit. Crosby made kicks from 26, 52, 31, 42 and 45 yards in the Packers’ 22-9 victory, improving his mark to 9-for-9 on the season. A Packers kicker hadn’t made five field goals in a game in 13 years, and he tied the franchise record for most in a single game, matching Chris Jacke (who did it twice, in 1990 and 1996) and Ryan Longwell (2000). Crosby has now made 13 straight field goals in the regular season, dating back to 2012. Including last year’s two playoff games, he has made 15 in a row. Crosby holds the franchise record with 23 consecutive field goals made in the regular season, which he set from Week 13 of 2010 through Week 12 of 2011. This marks the fifth time in his career that Crosby has been named NFC Special Teams Player of the Week, and the first time since Week 7 of 2011. –One snap but good: Rookie DE Datone Jones lasted only one snap in Friday’s preseason opener before leaving with an ankle injury, but when his teammates viewed that snap on film, they were impressed. Mike McCarthy said Jones would be out of practice for at least a couple of days, and he wasn’t sure if he’d be available to play in St. Louis on Saturday night. 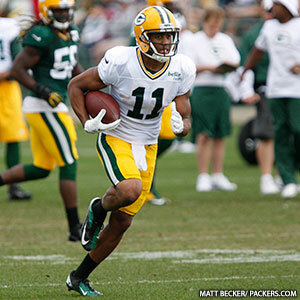 –More on injuries: WR Randall Cobb (bicep) was back at practice on Monday with a wrap on his upper right arm. G T.J. Lang (back) did not practice and was replaced at right guard with the No. 1 offensive line by Don Barclay. McCarthy called the holding out of Lang “precautionary” and suggested it could continue on Tuesday. RB Eddie Lacy (hamstring) missed practice again and did some testing of his injury, but McCarthy said he didn’t know how the test went. –New outlook: Two of the Packers’ backup offensive linemen who have received praise lately from the coaches and whose reps are increasing are second-year pro Greg Van Roten and undrafted rookie Lane Taylor. Van Roten appears to be the top backup at center behind Evan Dietrich-Smith, and he also takes a fair share of snaps at guard. Taylor has worked both guard spots in camp and managed to play well in Friday’s game despite a lack of rest. The day before the game, Taylor’s wife gave birth to the couple’s first child, a daughter. He missed practice on Thursday but slept at the hospital that night with his wife and newborn, who arrived just after 5 p.m. 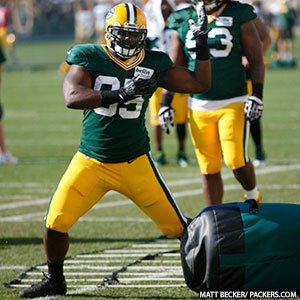 He returned to Lambeau Field on Friday to prepare for the game and performed rather well. Undrafted out of Oklahoma State, Taylor had a handful of free-agent offers after the draft and chose Green Bay, seeing it as a “good fit.” He has a legitimate shot at a roster spot, but he admitted there’s even more motivation now with a daughter on his hands. Getting his kicks: K Giorgio Tavecchio won Monday’s head-to-head kicking competition by going 8-for-8 on field goals to Mason Crosby’s 7-for-8. Crosby’s lone miss was wide left from 46 yards. With neither kicker getting a chance in Friday’s game, they can expect more work in practice as the preseason continues. “If they ask us for 30 kicks, we’ll give them as many as we can,” said Tavecchio, who continues to preach his one-day-at-a-time approach in his effort to take Crosby’s job. “It was a warm day today, so the balls were flying,” he said. “I felt like myself, Tim (Masthay) and Brett (Goode) were in a good rhythm with the snap, hold and kick. –Young more involved: New QB Vince Young took far more snaps in the team (11-on-11) drills than he did his first day, and the uneven results were to be expected. It appeared on one play that Young’s cadence caused someone to false start, and later he overthrew TE D.J. Williams, leading to an interception by S Chaz Powell. He came back from that to make a good throw to WR Jeremy Ross, only to have it knocked away at the last moment by CB Loyce Means. –Kickers even: In a brief kicking session, both Mason Crosby and Giorgio Tavecchio went 3-for-4 on field goals. Crosby was good from 36, 46 and 48 but missed wide right from 50. Tavecchio was good from 36, 48 and 51 but missed wide left from 46. Not to get lost in the competition is the burden placed on holder Tim Masthay, who has to switch back and forth holding for both a right-footed (Crosby) and left-footed (Tavecchio) kicker from snap to snap. Masthay also has been taking regular reps kicking off, and he did well in last Saturday’s scrimmage, but he was audibly upset at himself when he flubbed a low line-drive kickoff in practice on Wednesday. Masthay kicked off in college at Kentucky and enjoys getting his swings in. –Different perspectives: Whether or not the post-whistle skirmishes witnessed Wednesday are good for the team depends on the point of view. DL Mike Daniels, who has been one of the more outspoken and feisty players throughout camp, loves it. QB Aaron Rodgers chalked up the extracurricular activity to fatigue and didn’t particularly care for it, but he agreed that it’s simply time to play against an opponent. –Next man up: Rodgers called his new left tackle, rookie David Bakhtiari, “raw” and said he’ll be learning “in the fire” if he’s indeed the Week 1 starter. Bakhtiari will be charged with handling the opponent’s best pass rusher on a regular basis, and Rodgers will need to have confidence that his blind side isn’t constantly under siege. 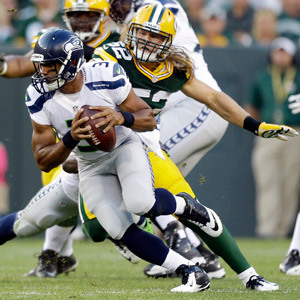 Another injury on the offensive line could be problematic, though, Rodgers suggested. The Packers didn’t bring any other kickers in to compete with Mason Crosby when he was slumping. The 49ers did, with incumbent David Akers and newcomer Billy Cundiff staging a weeklong competition to see who will kick on Saturday night. Crosby reiterated again on Thursday that he was plenty motivated by his own struggles, whether or not the Packers brought in some competition for his job. But he does appreciate the support the organization showed him, and after making five consecutive field goals over the last three games, his focus is on continuing the strong finish to an otherwise rough season. “For me, it’s about finishing everything,” Crosby said. “I finished the regular season strong, and now it’s finishing these playoffs and every opportunity I have. I’m thankful to be here. Packers K Mason Crosby knows he could be in a very different situation right now. All he has to do is look at the San Francisco 49ers, who signed veteran K Billy Cundiff this week amidst regular K David Akers’ struggles. The Packers didn’t go that route during Crosby’s midseason slump. They maintained their confidence in him and let him work his way out of it, and he’s rewarded that trust with four straight successful field goals over the last two games, including two clutch kicks last week at the Metrodome — a 51-yarder on the final play of the first half and a 40-yarder to tie the score early in the fourth quarter. Crosby said he wouldn’t have found any extra motivation had the Packers brought in another kicker to compete with him and possibly take his job. He said he gets his motivation internally and through the support of his teammates, whom he doesn’t want to let down. Crosby added that he likes the vibe around the team this week as the playoffs approach, saying the players can feel a “buzz.” Last week’s loss was difficult, but at this point there’s no looking back.